Dead reckoning, as applied to flying, is the navigation of an airplane solely by means of computations based on airspeed, course, heading, wind direction and speed, groundspeed, and elapsed time. Dead reckoning which, to oversimplify, is a system of "determining where the airplane should be on the basis of where it has been." In other words, it is literally deduced reckoning, which is where the term came from, i.e., ded. or "dead" reckoning. The most common form of VFR navigation is a combination of dead reckoning and pilotage, during which the course flown and the airplane's position are calculated by true dead reckoning and then constantly corrected for error and variables after visually checking nearby landmarks. The simplest kind of dead reckoning assumes that the air is calm. If the wind were to remain calm, the airplane's track (path) over the ground would be the same as the intended course and the groundspeed would be the same as the airplane's true airspeed. As shown in Fig. 12-3, an airplane flying eastward at an airspeed of 120 knots in still air, will have a groundspeed exactly the same - 120 knots. If the mass of air is moving eastward at 20 knots, the speed of the airplane (airspeed) through the air will not be affected, but the progress of the airplane as measured over the ground will be 120 plus 20, or a groundspeed of 140 knots. On the other hand, if the mass of air is moving westward at 20 knots, the airspeed of the airplane still remains the same but the groundspeed becomes 120 minus 20 or 100 knots. In preparation for the combination of elementary dead reckoning and pilotage on a cross-country flight, the proposed course line to be followed is drawn on the chart and measured with a protractor to determine the number of degrees it lies from true north. This is called "true course" (TC). To the number of degrees thus measured, the pilot must add or subtract the "magnetic variation" (shown on the chart by a red, dashed, isogonic line). The variation shown is the angular difference between true north and magnetic north in that particular locality. As we know the true North Pole and the magnetic North Pole are not located at the same place. Since the magnetic compass points to the magnetic North Pole, it indicates a magnetic direction. The course line on the chart is measured in relation to true North; therefore, the "True Course" must be converted to the "Magnetic Course." When converting from a "true" to a "magnetic" course, the pilot adds westerly variation, or subtracts easterly variation. The resultant figure should be written down beside the course line and is termed the "Magnetic Course" (MC). In actual flight, winds may cause considerable deviation from the desired ground track unless some sort of correction is made. An airplane flying within a moving mass of air will move with the air in the same direction and speed that the air is moving over the ground. Consequently, at the end of a given time period, the airplane will be in a position which resulted from a combination of the two motions: the movement of the air mass in reference to the ground, and the forward movement of the airplane through the air mass. As shown in Fig. 12-4, if the airplane is flying eastward at an airspeed of 120 knots, and the air mass is moving southward at 20 knots, the airplane at the end of 1 hour will be at a point that is approximately 120 miles eastward of its point of departure (due to its progress through the air) and 20 miles southward (due to the motion of the air). 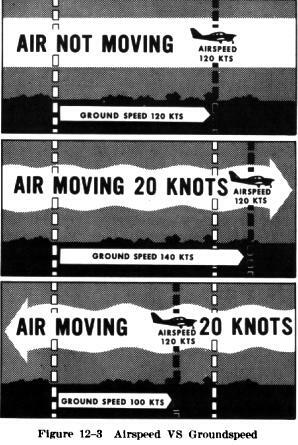 Under these circumstances the airspeed remains 120 knots, but the groundspeed is determined by combining the movement of the airplane with the movement of the air mass. Groundspeed can be measured as the distance traveled in 1 hour from the point of departure. The groundspeed can be computed in flight by noting the time required to fly between two points a known distance apart (two checkpoints on the course). It also can be calculated before flight by plotting the airplane's heading and airspeed along with a wind vector. This is done most frequently by means of an air navigation computer - a circular type slide rule. The direction in which the airplane is pointing as it flies is its heading (Fig. 12-5). Its actual path over the ground, a combination of the motion of the airplane and the motion of the air, is the ground track. The angle between the heading and the track is termed drift angle. As demonstrated in Fig. 12-5, if the airplane is headed along the course line with the wind blowing from the left, the track will not coincide with the desired course. The wind will drift the airplane to the right, so the track will lie to the right of the desired course. By anticipating the amount of drift, the pilot can counteract the effect of the wind, thereby making the ground track of the airplane coincide with the desired course. If the mass of air is moving across the course from the right, the airplane will drift to the left, and a correction must be made by heading the airplane sufficiently to the right to offset this drift. 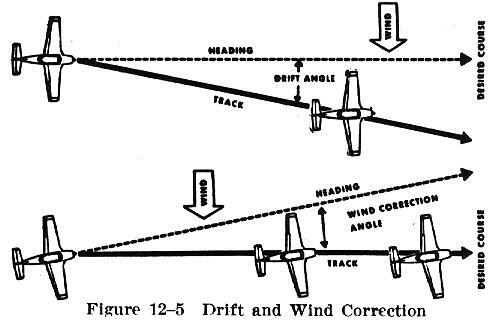 If the wind is from the left the correction must be made by turning the airplane to the left - into the wind (Fig. 12-5). Familiarity with a magnetic compass is essential, not only so that it can be read easily and accurately, but in order that the pilot may have complete confidence in the instrument. Despite tales of compass failure, actual instances of such are rare. Compasses may spin temporarily, or read inaccurately over areas where there is a natural magnetic disturbance, but its inherent idiosyncrasies are not to be seized upon as the cause of poor navigation. Trusting the compass implies a knowledge of how it functions. The magnetic compass does not point to true north, but is controlled by the lines of force in the earth's magnetic field. These lines are not parallel to the meridians (lines which meet at the true North and South poles of the earth); they diverge from the meridians at different angles in different locations on the earth's surface. The amount of this difference, or "variation," is indicated on all aeronautical charts for the benefit of pilots. The compass is affected also by the attraction of metal, such as the engine, wiring, radio, and steel structure of the airplane. Compensation is made for this through a ground procedure referred to as "swinging the compass" and the deviation from various magnetic directions is noted on a compass card installed in the cockpit. Thus, in computing a compass course, both variation and deviation must be allowed for on all headings. Keeping an airplane flying on a desired heading using only a magnetic compass can be frustrating to a pilot who is not familiar with the compass's characteristics and errors. This lack of understanding can result in the pilot thinking that the compass has malfunctioned and headings are unreliable. No attempt should be made to read the compass until the airplane has been held straight and level for at least 30 seconds because the compass is deflected during any inclination or banking. This is the result of the Magnetic North Pole (toward which the needle attempts to point) being actually below the horizon, due to the curvature of the earth. This is called magnetic dip. In level flight it is easier to fly the average compass indication than to try to hold an exact heading. To steer a course after the airplane has been established accurately on the desired course, one should look directly ahead to select some object to head toward, and then note the compass indication to determine whether the proper heading is being maintained. If it is not, a slight change should be made relative to the object. It will be found that a knowledge of the principles of dead reckoning is very important not only in planning the course and determining the elapsed time required for the flight, but in assisting the pilot in determining the airplane's position after having become disoriented or confused as to the airplane's position. By using information gained on the part of the flight already completed, the pilot who is thoroughly familiar with these principles can determine the airplane's approximate present position. In this way, it is possible to restrict the search for identifiable landmarks to a limited area to verify calculations and to relocate one's self.